The aerodrome was built in 1917, too late to make much impact on WW1. But as a base for our fighter squadrons, it played a vital role in WWII, from the battle of France to the assault on Hitler’s Europe. Churchill spoke in 'matchless' words of the pilots who won the Battle of Britain. Those pilots, backed by thousands of ground staff, operated from just a few aerodromes. 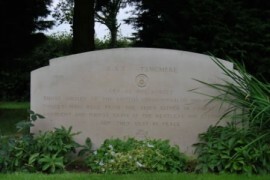 Tangmere was ‘one of the few’. The idea of using the Tangmere area as an aerodrome happened by accident, following an emergency landing by a young Royal Flying Corps trainee pilot, Lieutenant Geoffrey Dorman, in a biplane. He landed in a large field several hundred yards square following engine problems. Reporting back to Gosport, he put forward the suggestion that this would make an excellent site for an aerodrome. Local protests were ignored and the site was cleared. By the end of September 1917 the field was in use by the Royal Flying Corps for flight training. Then when America entered the war it was used as a training depot for Handley-Page pilots and large hangars were constructed to house these large planes. The hangars were built by German prisoners of war. By the time the site was complete and ready to use in September 1918 the war was almost at an end, and the site was handed back to the RAF and closed down on December 1919. The station was re-opened in 1925 to accommodate a coastal storage unit of the Fleet Air Arm. In November 1926, No 43 Squadron (equipped with Gloucester Gamecocks) and No 1 Squadron (equipped with Siskins) were stationed at Tangmere and so began a long association. Tangmere was a much sought after posting being located between the South Downs and the sea; all kinds of sporting activities were enjoyed. Hawker Furies were used in Tangmere between 1931-32. They were then replaced with the Gloster Gladiators in 1937. The first Hawker Hurricane was delivered in October 1938, at about the same time the country was realising that conflict was inevitable. In 1939 Tangmere became sector Headquarters in No 11 Group Fighter Command, with a number of squadrons under its control in the local area. Tangmere was now at the front line in the defence of London and the south east of England. After the outbreak of war the area was comparatively quiet until May 1940 but then the Germans advanced into France and squadrons were engaged in support of the Allied armies. No 1 squadron was one of the first of the British fighters to arrive in France.